Dharmasala: Riding high on the stupendous performance of skipper Rishi Dhawan, Himachal Pradesh cricket team has managed to take vital 118 runs leads over Assam in the first inning and still has six wickets in hand in a Ranji Trophy – Group C match at Himachal Cricket Association Stadium, Dharmasala. 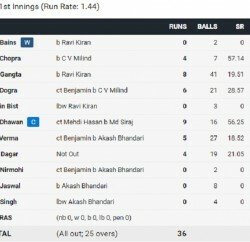 Earlier, opting to ball, Himachal bowlers led by Captain Rishi Dhawan, who took five wickets, bowled Assam on paltry 81. 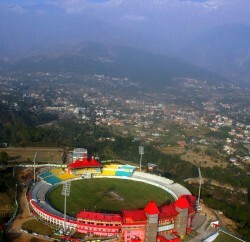 Dhawan took five, whereas Vikramjeet Malik and Akshay Chauhan took three and two wickets of opposition respectively. Niraj Patel and Jamaluddin Mohammad were the top scorer for Assam, they scored 17 each and experienced Dheeraj Jadhav could add only 13 runs to the scoreboard. Apart from these three batsmen, none of Assam’s batsmen managed to cross the double figure. After folding Assam at 81 in 32.5 over, Himachal batsmen started well and made 46 for the first wicket. Prashant Chopra was first to get out, he made 39 in 49 balls, in which he hit eight boundaries. Opener Sangram Singh and Paras Dogra then played patiently and took team score to 117. Dogra got out on 38 and out of form Amit Kumar followed him without scoring a run and then experienced Sangram Singh also lost his concentration and get out after making 40 runs, team’s score was 119 for 4. After that Himachal batsman Nikhil Gangta and Captain Rishi Dhawan played cautiously and managed to take team score to 199. Nikhil Gangta is playing at 43 and Dhawan is not out at 36. Himachal team is topping the point table of Group C with 16 points from four matches. Team has won two matches and drawn and lost one. Himachal skipper has taken 34 wickets so far in Ranji Trophy, 2013/14 season. He is a highest wicket taker in this season. Assam: Niraj Patel and Jamaluddin Mohammad 17, Rishi Dhawan, 5 for 29 in 13 over, Vikramjeet Malik 3 for 24 and Akshay Chauhan 2 for 23 in 8 over. Himachal: Nikhil Gangta – 43 and Sangram Singh 40, Arup Das 2 for 66.